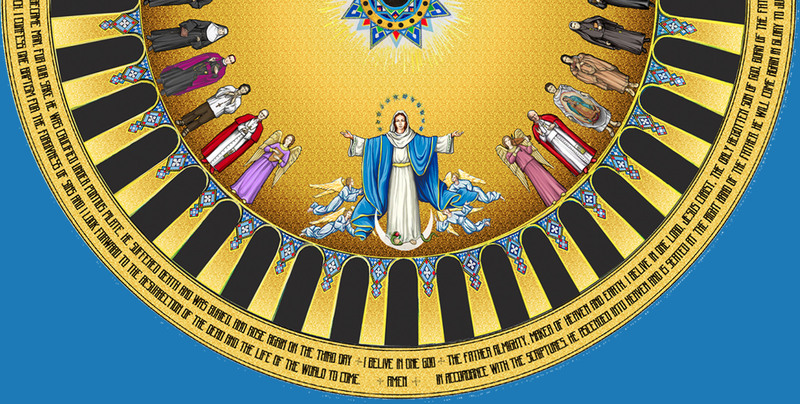 The Trinity Dome mosaic encompasses a procession of saints of multiple nationalities and cultures. However, each and every saint depicted shares a deep connection with the Basilica of the National Shrine of the Immaculate Conception and with the pioneering of American Catholicism. In our last post, we highlighted two of North America’s pragmatic indigenous saints: St. Kateri Tekakwitha and St. Juan Diego. This week, we are excited to reveal two of North America’s most iconic missionaries, to be memorialized on the Trinity Dome: St. Frances Xavier Cabrini and St. Junípero Serra. Which North American Saints Grace the Trinity Dome Mosaic? With the completion of the Trinity Dome mosaic, the Basilica of the National Shrine of the Immaculate Conception will be finished according to the original design. The mosaic will depict the Most Holy Trinity, the Blessed Virgin Mary as the Immaculate Conception, the Nicene Creed, and the four Evangelists. One of the most striking elements of the dome is the diverse depiction of saints who have a special association with the United States and the National Shrine. Among the saints are two of North America’s most iconic indigenous saints: St. Kateri Tekakwitha and St. Juan Diego. As its one hundredth anniversary approaches, a monumental effort is underway to complete the Basilica of the National Shrine of the Immaculate Conception according to its original architectural and iconographic plans with the mosaic ornamentation of what will be the “Crowning Jewel” of Mary’s Shrine—the Trinity Dome. Artisans in northern Italy are now piecing together the mosaic that will cover the surface of the Trinity Dome. The full-scale sketches of the dome were passed along to the mosaic artists, who began the process of color-coding mosaic tiles by hand, delineating more than one thousand variations of colorful Venetian glass.